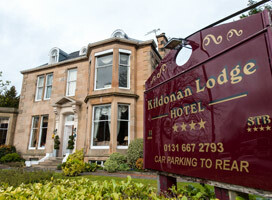 The 4* Kildonan Lodge Hotel is a grand Victorian property close to Edinburgh City Centre. Just 1.5 miles from the city centre, the hotel is in a peaceful location without taking you too far from the sights and sounds of Edinburgh. Guests can take advantage of the hotel`s ample free parking and use the excellent bus service to travel into the city centre. The bus stop is outside the hotel and buses run every few minutes. The journey takes 15 minutes to the Royal Mile, which is the heart of historic Edinburgh, linking Edinburgh Castle and the Palace of Holyrood. Whilst strolling between these two great landmarks visitors can also make a stop at the Museum of Edinburgh which charts the cities fascinating history. The hotel is also ideal for visitors to other locations within the Edinburgh area including Murray Field Rugby Stadium which is just 17 minutes drive from the hotel and The Royal Botanic Garden of Edinburgh approximately 25 minutes drive. More Info. Family rooms: 1 child up to the age of 12 can stay free when sharing with parents, using existing bedding. Baby cots provided free of charge (On request) phone 0800 633 8000.